The answers to all these questions can be found in the 2018 issues of the magazine. After six years the Wychwoods said goodbye to Rev’d Kate Stacey. Where did she go? 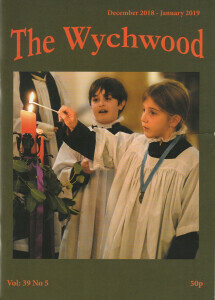 What was the cost of the first issue of the Wychwood Magazine when it first hit our doormats in April 1980? Which famous local wood turner was once head of the probation team in Wormwood Scrubs? Who started an educational charitable trust for young people in the Wychwoods before she died in 1811? On which Channel Four TV programme did local upholsterer Percy Hickman make a guest appearance? Which local organisation celebrated its centenary last year? What did Mike Pearce capture when out walking with Tilly? How did Jubilee Lane get its name? By what name is Parsonage Farm in Shipton now known? Who took over as the manager of the Wychwood library this year? Which local pub was voted the Good Pub Of The Year for 2018? Who spent 12 years working in Uruguay and did their training in Montevideo? What project did the Wychwood Woolly Wonders undertake? What did Dr. Nixon want to be when he grew up? Who was sent ‘over the hills to glory’? Who won the Under 15 Cup at the 2018 MUWAGA Produce Show? Where could you have found the Foundry Men on the 9th November? Our milkman has been delivering milk for over 30 years. What is his name? Who are Sparky, Hobnob, Dumplin’ and Buddy? Where were Bronze and Iron Age remains found by Pierre Manisse in the Wychwoods this year? 20. The field next to Wychwood School.